The view looking west from our launch is the open sea of the Persian Gulf and the branches of Dubai’s famous Palm Island reach into view as your gaze moves north. 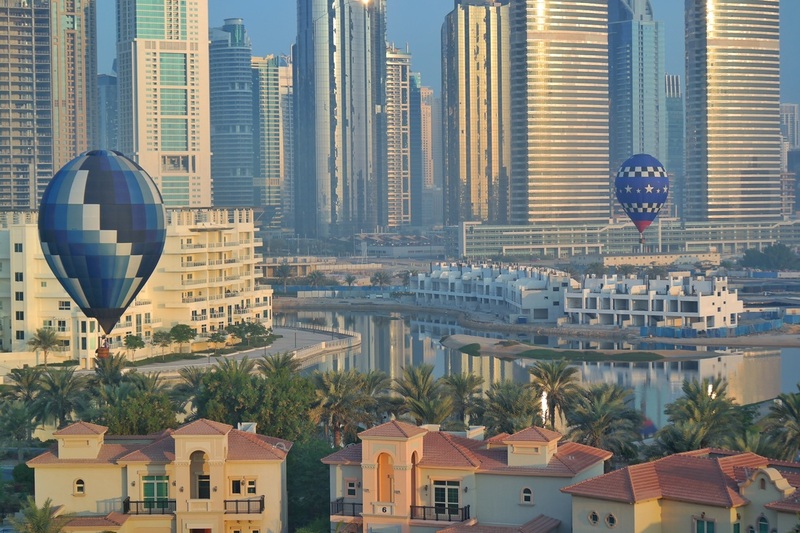 The coast is behind us to the east and it is lined with the architecturally unique high-rise buildings that Dubai is becoming known for. 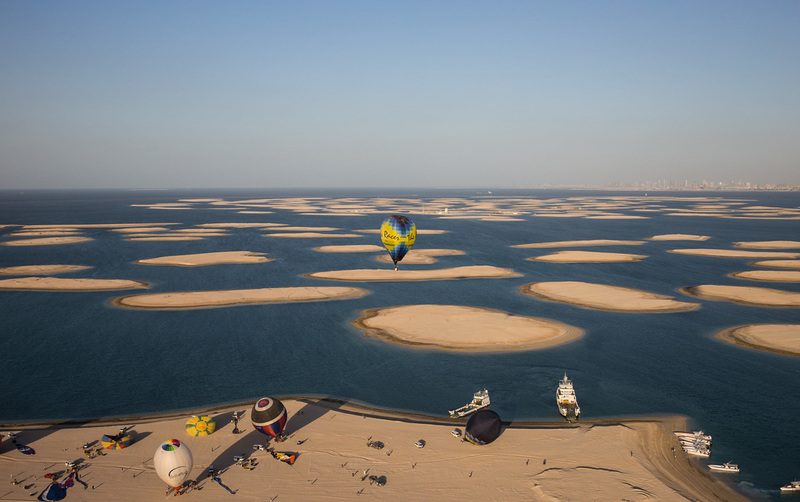 The 70 balloon field is staged on a peninsula of sorts, human-made of course, that serves as the home of Skydive Dubai, the host of the 2015 World Air Games. 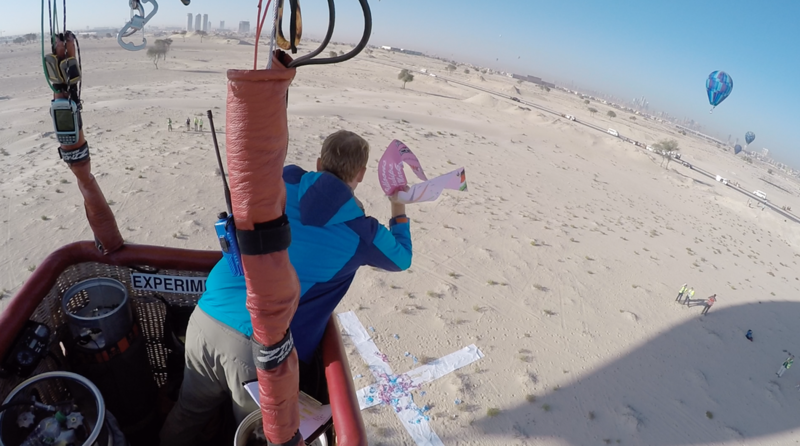 Dubai balloonist Mike Howard assures us that despite the surface wind gently blowing out to sea, we’ll be able to climb and catch a wind back to the mainland. The rays of an orange sun rising over the distant desert reach between the buildings as we climb beside them. Aloft, we catch the wind back to land and traverse the metro area that lines the coast. The waters of the Dubai Marina loop between the buildings in this part of town and it’s where the super-rich park their mega yachts. The skyscrapers thin out about 5km inland and the flying area opens up into a more welcoming suburban environment where people come out of their houses to catch a glimpse as we fly past. The event hasn’t even officially started, but for most pilots this practice flight made the whole trip worth it. ​​UNCERTAINTY SURROUNDED the air games in the months and weeks leading up to the event. Communication on the shipping procedure and hotel accommodations were sparse at best, and there was no competition map until just days before arrival. Most of us debated our participation altogether at least a few times, but the lure of the potential adventure an event like this could offer was too great to resist. From the moment we arrived the event had an overwhelming Olympic feeling to it, more so than any other international competition I’ve participated in. 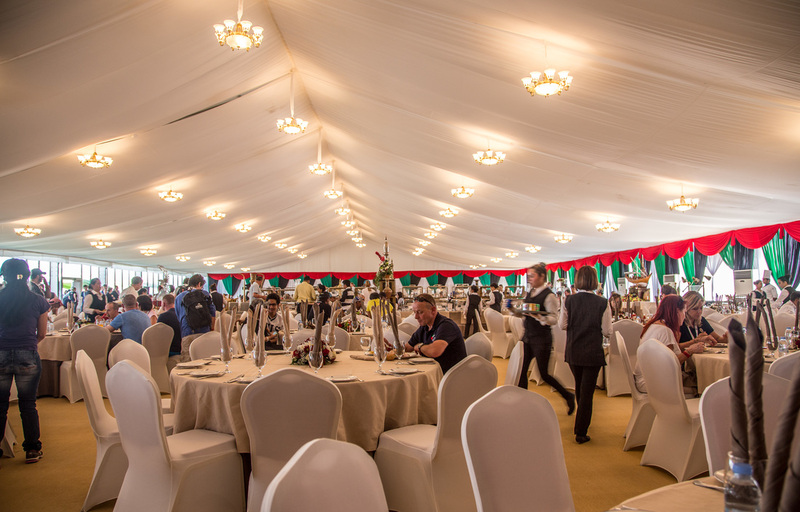 The purpose-built compound serving as event headquarters at Skydive Dubai held offices for the director and officials of each sport, a large hall for press conferences and medal ceremonies, and a media center to broadcast images and videos of the event all over the world. Balloons were only one piece of the overall event which featured thirteen airsport disciplines from skydiving to aeromodelling. In the dining hall at Skydive Dubai the organization served up impressive spreads of local and international cuisine. Meal times served as a gathering place for competitors of all sports and countries and facilitated international socialization while we all got some relief from the sun. 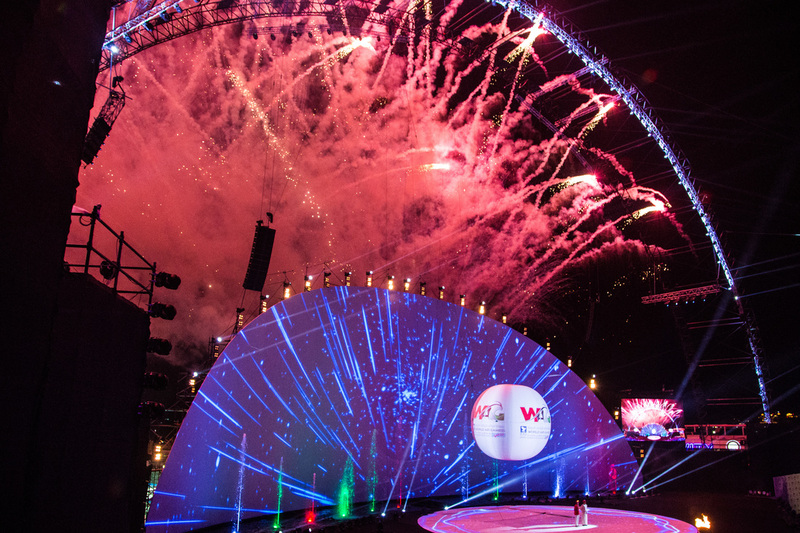 On opening night of the WAG, thousands of competitors gathered in a stadium structure at Skydive Dubai with local dignitaries and Dubai royalty to witness the dramatic and theatrical opening ceremonies. 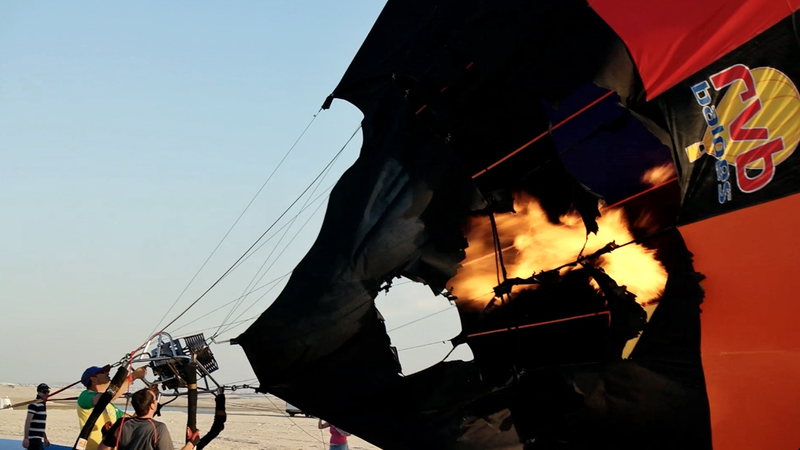 Actors flew around the stadium on wires and interacted with the large video screen, water cannons, and pyrotechnics to portray different airsport disciplines while highlighting the Emirates’ culture. Competitors could sincerely appreciate the size and scope of the event after this ceremony, only to be surpassed by the extraordinary flying that still lay ahead. A THICK HAZE gripping the city obscures the rising sun and casts an eerie feeling across the metropolis. We’re staged at the Palm for another launch and despite being on hold for the low visibility, there is a buzz across the field ahead of the potential flight. A stronger surface wind is present this morning that would allow us to make considerable distance off shore before climbing to turn back for land. Finally the green flag is raised and a roar of inflator fans pierces the morning air. Seventy balloons scrape the surface after launch to carry the low wind to the sea, close enough together to see the exuberance on the faces of our counterparts from all over the world. In an example of sportsmanship and international comradery that would come to define the event, I see French pilot Clément Seigeot, whose balloon has been stuck in customs, flying a balloon borrowed from Lithuanian pilot Rokas Kostiuskevicius. A kilometer from launch we pass the first branch of the Palm Island. The surprised residents have emerged from their villas and gaze skyward in total amazement of the big bubbles of color passing overhead. We flew on past the large yachts moored offshore because they were too large to enter the marina. Deck crews hard at work at the morning duties pause in amazement to watch us pass by. As if to lure us back to land, officials set a practice target a few hundred meters inland from the beach on a vacant lot amid the towering buildings. On approach into the target a 130 degree wind shift creates a situation where balloons fly directly towards buildings that rise above us before descending to catch the lower wind away from the obstacle. A red PZ for a royal palace just downwind from the target forced the balloons into an immediate climb after throwing their marker as we were warned that a low pass over the palace would disturb the lions that live on the grounds. All things considered, this is the most difficult target I’ve ever flown into. We carried the higher wind over the remainder of the city. 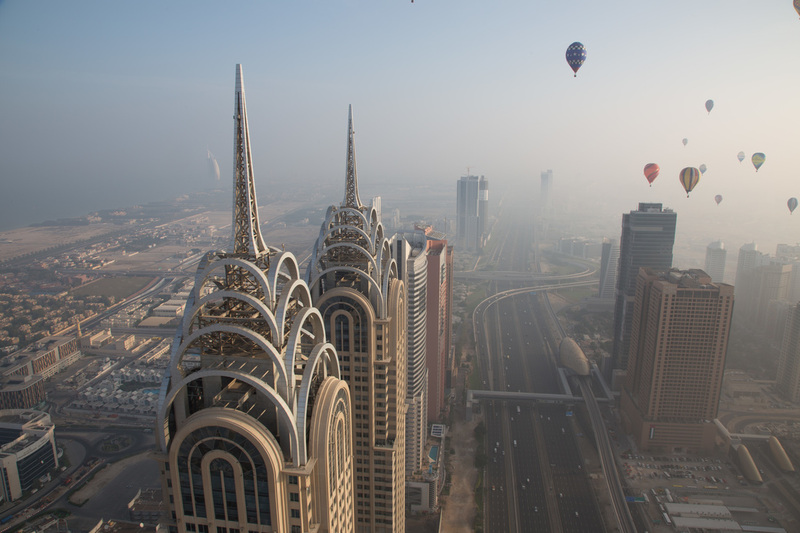 Now more comfortable with city flying, some pilots took to flying a slalom course through the buildings. We eventually completed the magnificent flight well inland on a road in an undeveloped piece of desert. The flight will live with many of us as a career topping experience, only to be eclipsed for some by the final flight of the event yet to come. THE COMPETITION was the reason we were all there, but in the end it may be overshadowed by the spectacular and thrilling nature of the flights. Nine tasks in total were flown over four competition flights. 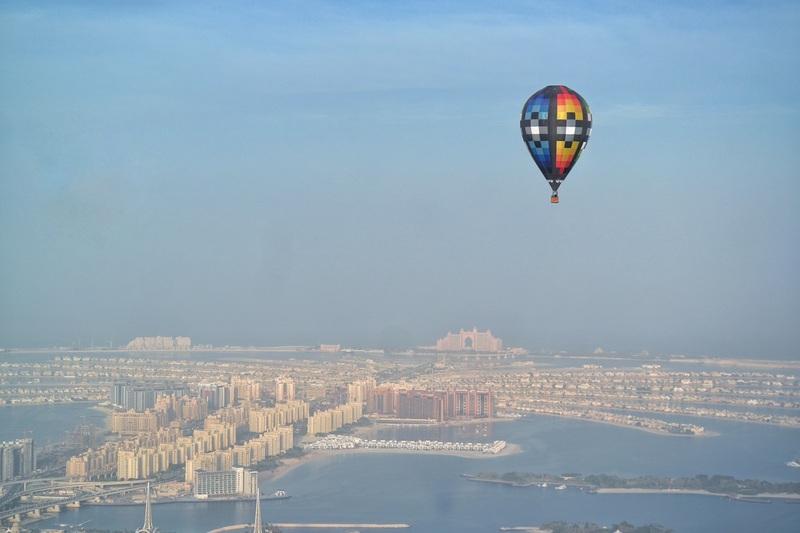 Dubai weather seems to be very conducive to ballooning in the winter months; very steerable winds existed well into the morning hours and evening conditions were similar with what we might find on a summer evening in the US. Logistics were another issue, however, because the ceiling of the event was set at 2000ft and officials warned that if any pilot went higher the whole event would be cancelled. PZs seemed to be a moving target for officials as they released additions and changes to the PZ list at almost every briefing, which made things difficult for pilots. It’s most likely for these reasons that almost half of the tasks were Hare n Hounds, allowing officials to guide the group through the flight and around sensitive areas on the map. The WAG billed the competition as the world’s best pilots and the group certainly lived up to that statement. Scores were tight on every task including an amazing HNH task with over half the field under a meter result. After a very windy HNH task far out in the desert to end the competition, German pilot David Strassman came out on top ahead of Seven Vlegels of Belgium and Stefan Zeberli of Switzerland. The challenge of these flights from a logistical standpoint cannot be understated. Whether it was obvious obstacles like skyscrapers, the sea, or a royal palace; or invisible ones like clearing a certain airspace by a certain time because another airsport had to start its competition, the flying area may have been the most challenging aspect of the whole competition. The coordination of local organizer Mike Howard and Event Director Claude Weber with the WAG seemed to be never ending. At each briefing they would lay out an improbable plan of the flight that was, in the beginning, met with a healthy bit skepticism among the pilots. But each flight worked out almost exactly to plan and by the end of the week Howard could have told us we were flying to Iran and I think we would have followed him. Establishing this trust between Howard and the pilots is how, on our last day in Dubai, we had no second thoughts to follow him to an island some 15 miles out to sea for a flight back to the mainland. THE VANS ROCKED in unison as the barge bobbed in the swells enroute to the island. Crews bled air out of the tires in hopes of better traction on the loose sand that comprise the island. The ramp of the first barge slammed on the beach at 11am and the first half of balloons unloaded with fever so the barge could make it back to the harbor to load the next group. 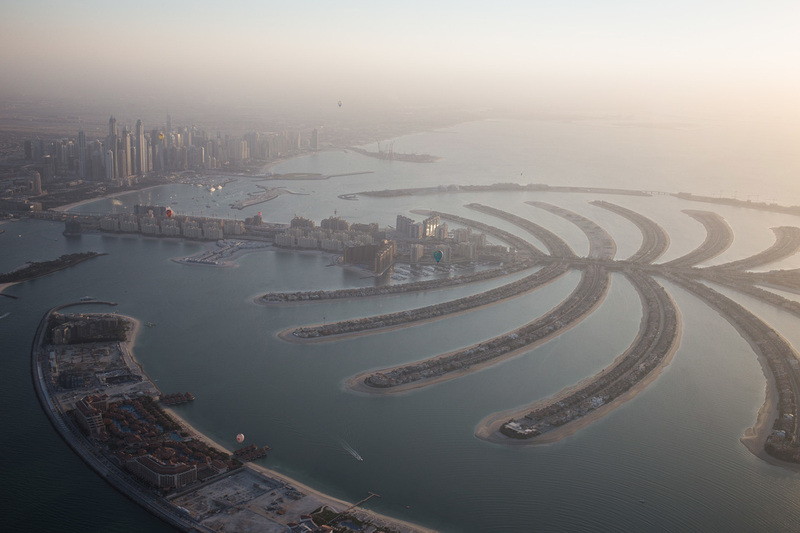 The island, part of Dubai’s World Island complex, is a barren and sandy place with no resources or facilities of any kind. Resourceful balloonists pitched camps with tarps and baskets to seek shelter from the sun. Others stayed cool by swimming in the chilly waters of the gulf. The second group of balloonists arrived a few hours later along with a catered lunch arranged especially for us by the Sheik’s men. The winds increased in speed steadily throughout the afternoon. At times, gusts picked up sand from the windward side of the island and whipped it across the balloonists and into the sea on the far side. Furthermore, pibals consistently showed the winds heading parallel to the coast, but Howard insisted that a late afternoon shift toward land was coming. 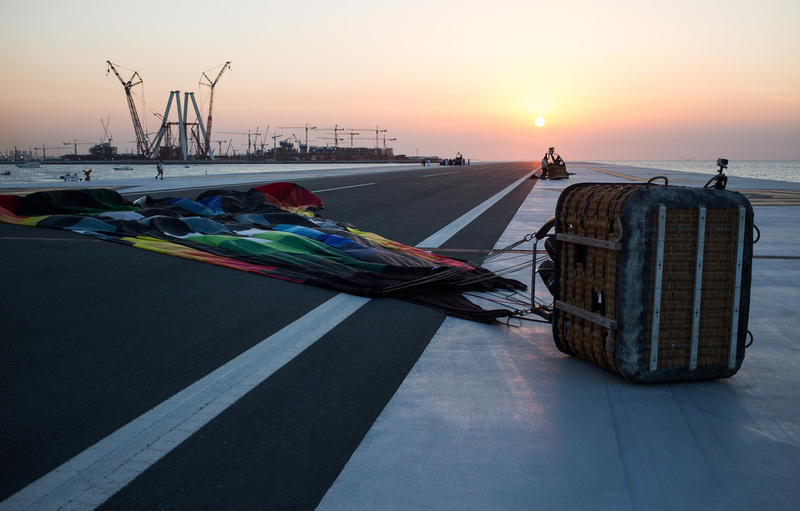 It wasn’t until the Russian team arrived on the island on the third barge with their theodolite that we saw a strong left turn at altitude which would take the balloons not only toward land, but made a potential landing at Skydive Dubai a possibility. The question became, would it hold through the flight window? Inflations started immediately and carnage ensued. Balloons rocked and fabric snapped as gusts continued to rip across the island, carrying with it the smoke and charred fabric of balloons upwind. It was a battle and for a period of time the wind had the advantage. Sheer determination of the pilots and crews eventually began to win out, marked by the howls of joy as baskets broke ground and climbed skyward. It was not pretty, not everyone who tried to launch was successful, and most who did seemed to sustain some kind of damage to their equipment. 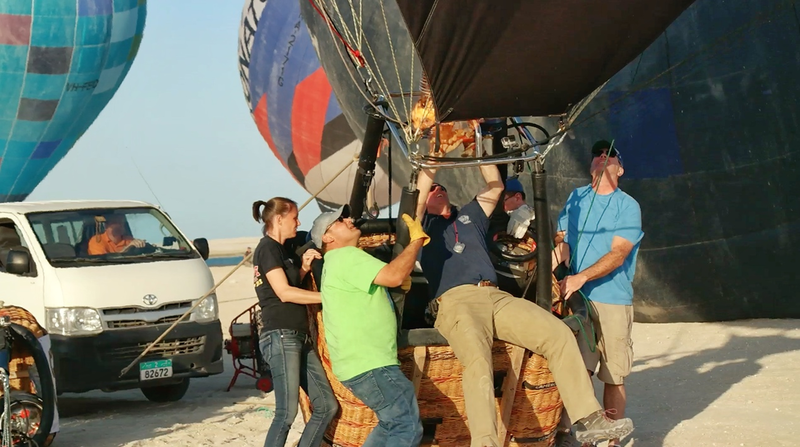 Several used the rolling takeoff: driving the chase vehicle forward to assist the balloon in standing upright. Others opted for a more dramatic release; Russian Sergey Laptov launched abruptly and had a line hanging below his basket suggesting a crew member had cut his tie-off from the van to get him airborne. Leaving the chaos of the launch field into the silence of free flight, the vastness of the sea must have been overwhelming. In the lower winds, balloons were still tracking into open water. Breaking into that high left turn and feeling the balloon turn toward land must have been a relieving feeling and the hour flight over the water must have gone by in a flash. We watched from our barge enroute to land as the final balloons made landfall just as the sun fell over the horizon. 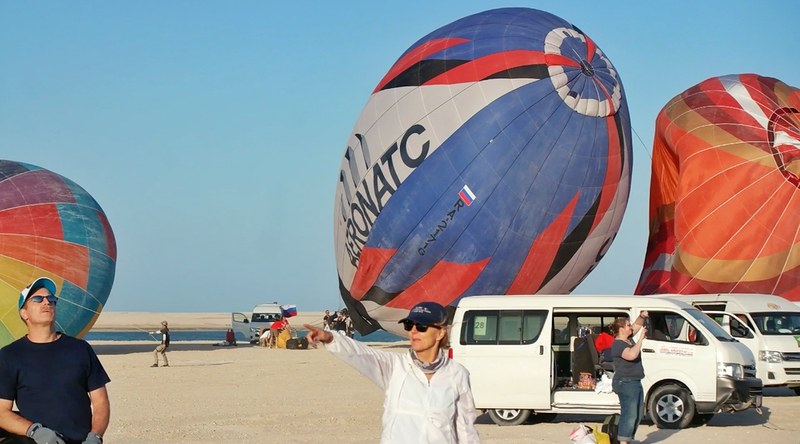 Word made it back to the boat that a majority of balloons were successful in landing at Skydive Dubai as the FAI President and local dignitaries participated in the closing ceremonies of the WAG: an amazing end to a tremendous event. 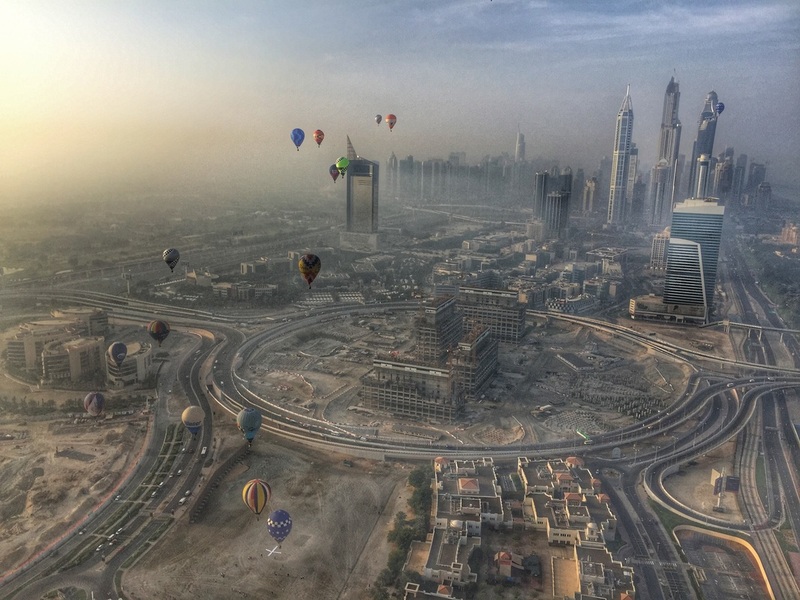 We may be separated by oceans and borders, but balloonists are bound by our shared passion for our unique type of flight and our experience at the WAG in Dubai is a shining example of why we are all addicted to this sport. It's the friendships made and strengthened through an incredible week of flying that make an event like this so impactful on one’s life. Those of us lucky enough to participate are forever bonded by a shared adventure not soon forgotten and never to be re-created.